The West side of Colorado Springs truly has a different feel than other areas of the city. Located near N 30th St and Mesa Rd, residents in this area can enjoy spectacular views of the mountains and the Garden of the of Garden of the Gods landscape every day. The Sunrise Company is currently offering nine floor plans between 3,100 and 6,500 square feet. Home buyers can build a new energy efficient home in this resort community starting in the mid $400s. Residents can benefit from the gated community (24-hr watch), a 27 hole golf course, and a membership to the Garden of the Gods Club. The Garden of the God’s Club offers the golf course, indoor/outdoor tennis courts, a sports club, swimming pools, a fountain park, a spa and salon, a recreation center, and dining. Various activities are offered and members can also partake in cooking classes. There is a homeowner’s association that covers security, common areas, trash removal, and snow removal. Homeowners interested in a completely maintenance free lawn, can pay a higher monthly fee. 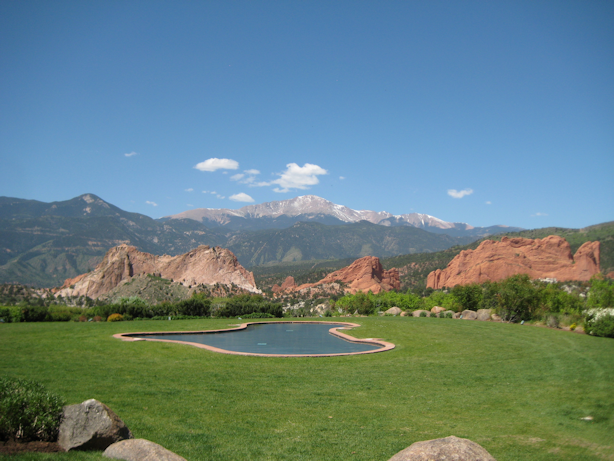 The Garden of the Gods Club is definitely worth a visit if you are interested in building a new home on the West side of Colorado Springs! Looking to get away? The Lodge at the Garden of the Gods Club is now open to the public. With each room offering awesome views of Garden of the Gods, it’s no surprise they get booked so quickly!